The advance guard met near the Quaker New Garden Meeting House. Banastre Tarleton's Light Dragoons were briefly engaged by Light Horse Harry Lee's Dragoons about 4 miles (6 km) from the Guilford Court House. The British 23rd Regiment of Foot sent reinforcements forward and Lee withdrew, ordering a retreat to Greene's main body. Cornwallis found the Americans in position on rising ground about one and a half miles (2.5 km) from the court house. He was unable to gain much information from his prisoners or the local residents as to the American disposition. To his front he saw a plantation with a large field straddling both sides of the road, with two more further over on the left separated by 200 yards or so of woodland. To his right beyond the fields the woodland extended for several miles. On the far side of the first field was a fenced wood, 1 mile (1.6 km) in depth, through which the road passed into an extensive cleared area around the court house. Along the edge of this woodland was a fence forming the American first line of defense and a 6-pound cannon on each side of the road. Greene had prepared his defense in three lines. North Carolina militia formed the first line, with backwoods riflemen on the left and right flanks to snipe advancing British. In the second line, he placed the Virginia militia. His regulars comprised the last line. Two more 6-pound cannon were sited in the center of the line. His third and strongest line, consisting of his Virginian Regiment, Delaware infantry, and the 1st and 5th Maryland regiments was a further 400 yards further on, though placed at an angle to the west of the road. While superficially resembling the deployment successfully used by Daniel Morgan at Cowpens, the lines were hundreds of yards apart and could not support one another. Since the east side of the road was mostly open, Cornwallis opted to attack up the west side and, following a short barrage of cannon shot on the cannon positions of the first line, at 1:30 p.m., Cornwallis moved his men forward. When they were about 150 yards short of the fence, a volley was fired from the Americans, whose long guns had a greater range than British muskets, but the British continued until they were within musket shot then fired their own volley in return. On a command from Webster, they then charged forward, coming to a halt 50 paces from the American lines because the North Carolina Militia, as noted by Sergeant Lamb of the 23rd Regiment "had their arms presented and resting on the picket fence...they were taking aim with nice precision". Urged onwards by Lieutenant Colonel James Webster of the 33rd Regiment of Foot, the British continued to advance. The North Carolina Militia, to the west of the road, fired their muskets then turned and fled back through the woods, discarding their personal equipment as they ran. The British advanced on the second line. Heavy resistance was shown, but Webster pushed around the flank and on to the American 3rd line. The woodland was too dense to allow practical use of the bayonets. The British army forced its way through the first two lines with significant losses. The 71st Regiment, Grenadiers and 2nd Guards moved up the center, following the musket shots from the 33rd and 23rd Regiments to their left. To the right, the 1st Guards and Hessians were being harried by Lee's Legion. The British guns and Tarleton’s Light Dragoons moved forward along the road keeping pace. The 2nd Guards in the center found themselves coming out into open ground around the court house to the left of the Salisbury road. They spotted a large force of Continental Infantry and immediately attacked them and captured two 6-pounders. They then pursued the Continentals into the wood and were repulsed by Colonel Washington’s Dragoons, and the 1st Maryland Regiment, abandoning the two guns they had just captured. Lieutenant Macleod, in command of two British 3-pounders, had just arrived and was directed to fire on the Dragoons. While many British soldiers were killed from friendly fire, the Americans broke off and retreated from the field. Cornwallis ordered the 23rd and 71st Regiments with part of the Cavalry to pursue the Americans, though not for any great distance. Tarleton and the remainder of the Dragoons were sent off to the right flank to join Bose and put an end to the action from Washington. During the battle, Cornwallis had a horse shot from under him. American Colonel Benjamin Williams was later decorated for his personal bravery at Guilford Courthouse. On March 15, Greene had divided his force into 3 separate lines of infantry supported by cavalry and artillery. Each line of battle was perpendicular to the New Garden Road, which ran through Greene's lines west to east before intersecting with the road from Reedy Fork behind the Americans. Guilford Courthouse sat within a T-intersection formed by the junction of these roads. The first line, behind a rail fence with the woods to their back, was made up of about 1,000 North Carolina militia, commanded by Brig. Gen. John Butler and Col. Thomas Eaton. In the center of the line was 2 small artillery pieces on the road. They could fire on the British while they crossed the open fields. The first line's left flank was supported by Lee's Legion and Campbell's Continentals. The right flank was supported by Lt. Col. William Washington's cavalry and Col. Charles Lynch's Riflemen. The second line, about 350 yards behind and further east in the heavy woods, was made up of 1,200 Virginia militia with a mixture of previously discharged Continental veterans. Here, they would provide cover for the first line. The third line, another 500 yards further to the rear on a slight rise near the courthouse, was the main line of battle consisting of 1,400 Continentals from Virginia, Delaware, and Maryland on the west side of the road. Cornwallis approached the American positions from the west along New Garden Road about midday. In his ranks were slightly less than 2,000 men. About 4 miles west of Guilford Courthouse, some of Greene's advance guard of cavalry, commanded by Lt. Col. Henry Lee, and dismounted infantry skirmished by using some harassing fire against the approaching British. A running battle eastward broke out. At 1:00 P.M., the British crossed Little Horsepen Creek (1/2 mile beyond the creek was the American positions) and deployed for their attack. Cornwallis brought his artillery to the front to counter the American artillery fire. He then divided his army into 2 wings on either side of New Garden Road. The left wing was commanded by Col. James Webster and the right wing was commanded by Maj. Gen. Alexander Leslie. Tarleton's Legion was held in the rear as a reserve force. The British advanced and when they approached within killing range, the Americans fired on them. The British continued their advanced, fired a volley, and then made a bayonet charge. The Americans leveled their muskets on the fence and fired a second volley. This volley was noted as one of the most effective single volley of the war. The British troops were surprised that the militia did not run away from the bayonet charge. This is what the American militia usually did before. The British steadied their line and continued their advance. The first line of militia melted away, along with the cavalry and infantry on the flanks. This was able to siphon the British strength from the main battle. The British moved toward the American second line. With the Americans deployed on wooded and hilly terrain, groups of them were able to surprise parts of the British line. Fighting an uphill battle confused the British, which began to lose their cohesion. The fight at the second line was a much harder and deadlier than the first line. The British were able to overlap the American right, bend it back, and soon made it collapse. Without much time to reorganize, Cornwallis ordered his troops forward where they soon ran into the last American line, which was its strongest. Webster launched a quick uphill attack on the American left. It was quickly repulsed and Webster was mortally wounded. On the British right wing, a bayonet charge was ordered to attack the American left. The British temporarily overran part of the American line and captured two artillery pieces. Greene saw this and ordered Washington's cavalry and infantry to seal the breach in the line. They engaged in a hand-to-hand fight with the British, recaptured the artillery, and sealed the breach. Cornwallis made a controversial call, deciding to bring up his artillery and fire over his own troops into the American line. This desperate move killed as many British troops as it did Americans, but it did halt the American counterattack. Tarleton was ordered to take his cavalry and engage the Americans. Thinking that his men were about to be driven from the field and accomplishing all that was possible, Greene decided to withdraw his force from the battlefield in an orderly retreat northwest on the Reedy Road. This allowed Cornwallis to claim a victory. Greene's decision to retreat proved to be a cautious but wise decision. Tarleton's cavalry, along with several Hessian units, swept what was left of the American force from the field. Cornwallis claimed a victory, but his forces suffered great losses. In London, when the battle reports came in, Charles J. Fox, a member of Parliament, remarked that "Another such victory would ruin the British army." After two years of the toughest of campaigning in South and North Carolina, Cornwallis pursued Greene’s army in an attempt to defeat him before launching the final and ill-fated British invasion of Virginia. 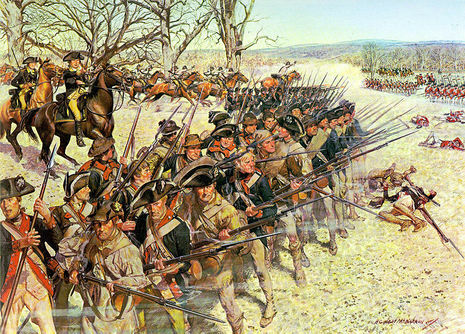 After a headlong march in which he constantly kept ahead of the British force, Greene halted to give battle at Guilford. He formed his army up at the Courthouse. Cornwallis rushed to attack him on the morning of 15th March 1781, his troops hungry and tired. The British advanced up a road through thickly wooded country to an area cleared for grazing a half mile short of the Courthouse. Beyond this area the woods continued until the road reached the Courthouse where there was another large cleared area. The first American line was formed across the northern edge of the first clearing and extended into the woods on each side: the North Carolina militia, Washington’s Legion, Lee’s Legion, and Campbell’s riflemen. Lee’s and Washington’s cavalry held the flanks. While there were initially two guns in this line, these were withdrawn as the battle began. Three hundred and fifty yards further back in the woods was a second line of Virginia Militia and at a similar distance to the rear at the Courthouse was the third line of two more guns and Greene’s Continental Infantry. On the advice of Major Morgan, Greene placed parties of riflemen behind the North Carolina militia with orders to shoot any militiaman who left his post before he had given the two discharges required of him. 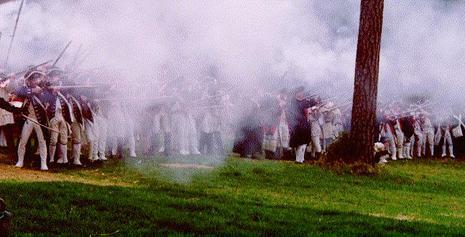 The Americans opened fire as the British appeared at the edge of the first clearing. Cornwallis formed his line from the right with Bose’s Regiment and the 71st commanded by Major General Leslie and the 23rd and 33rd commanded by Lieutenant Colonel James Webster of the 33rd. The second line comprised the two battalions of Foot Guards, the Light Infantry and the Grenadiers commanded by Brigadier O’Hara of the 2nd Coldstream Regiment of Foot Guards. Tarleton’s Light Dragoons formed the final reserve. The British line advanced across the cleared area under heavy musket fire suffering significant casualties. They were impeded by the fencing. The British Foot charged and the militia having delivered the two volleys ordered hurried away through the woods. The British were however still under fire from the American units in the woods on their flanks. The British line turned to deal with the menace and the grenadiers and one battalion of Foot Guards moved into the center to fill the gap. The British line now attacked the second line of Virginians who had been reinforced by Washington’s and Lee’s men and some of the North Carolina militia. Webster pushed hard at the right flank of the American second line and forced it back. His men then immediately attacked the Continental troops in the third line. A heavy fire and a charge repelled Webster’s 33rd and O’Hara’s Jaegers and Foot Guards. Following their charge the Continental regiments returned to their positions. The British left flank was reinforced with the 23rd and the 71st and the British attack was renewed. The American infantry gave ground but Washington’s charged the Foot Guards in the rear and an American counter attack led to a savage and confused melee. At this crisis Cornwallis ordered his three guns to fire grape shot into the struggling mass. American and Briton were struck down indiscriminately by this fire but the American assault was repelled. Tarleton then charged the American right flank. At this juncture Greene withdrew leaving his guns to the British. There was no pursuit. Cornwallis was left on the field, but his army was in a sad state. He had suffered heavy casualties which could not be replaced. He had no supplies and it began to rain heavily. Webster on whom he relied had been killed and O’Hara was wounded.